Happy holidays! In the spirit of the season, rediscover wonder and unwrap the Universe of Sound on Developer Labs. Plus, reach into touchless interaction with the Internet of Things and think about 3D app design with Lotus creator Eddie Lee. This week’s newsletter also features outdoor Christmas lights with Leap Motion color control, an Arduino-driven laser turret, and an experimental particle system. To subscribe to our developer newsletter and get updates through email, click here. 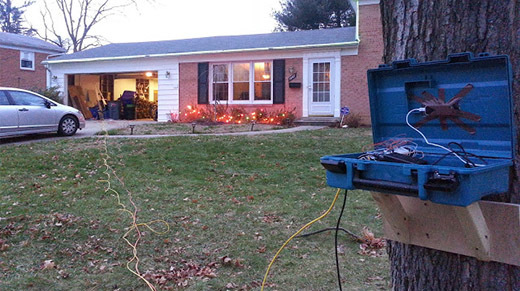 Bringing cutting-edge technology to the classic Christmas lights display. Using the Leap Motion Controller and an Arduino board, Kaitlin Devine built an outdoor installation that lets passersby control the color of her Christmas lights. Read more on Kaitlin’s blog or check out the code on GitHub. Create and control a flow of particles with your hand. Built in TouchDesigner, Simon Burgin’s particle system experiment lets users control the origin point of a stream, pause the flow, and create random interruptions. 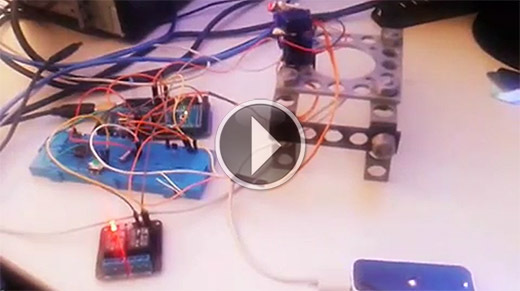 Karl Lilje created an Arduino-controlled laser turret, constructed on a 3D-printed mount, with Leap Motion interaction.